Corsair has just launched its latest, and fastest, range of M.2 solid state drives. The new Corsair Force Series MP510 M.2 PCIe NMVe SSDs offer sequential read speeds up to 3,480MB/s, and sequential write speeds up to 3,000MB/s. Storage capacities available in this M.2 2280 form factor drive once fully rolled out will be; 240GB, 480GB, 960GB, and 1920GB. 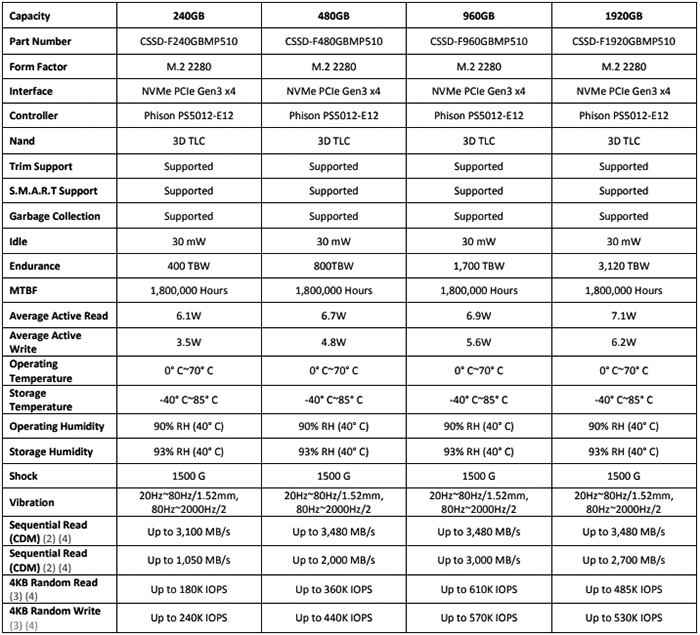 We are reminded that SSDs connected by the ultra high-speed NVMe PCIe Gen3 x4 M.2 interface deliver far greater bandwidth than SATA 6Gb/s drives on either SATA or M.2 connectors. Corsair says its new Force Series MP510 drives leave those oldies "in the dust". It goes on to predict that upgraders will benefits from perky OS, application, and data loading and saving times to "supercharge your system's performance, whatever you're doing." 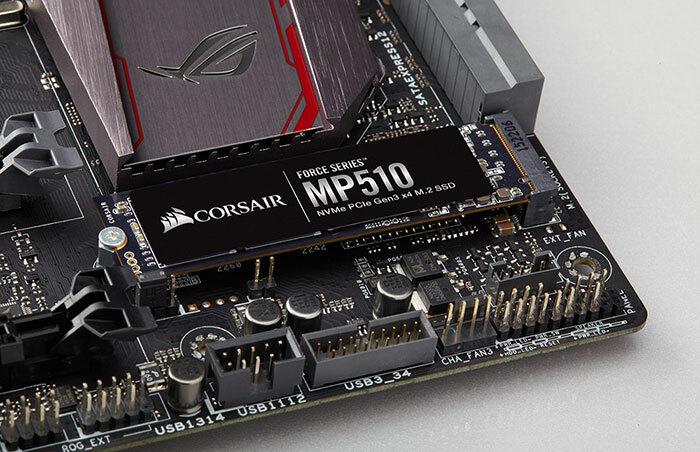 The storage chips on the Corsair Force Series MP510 sticks are high-density 3D TLC NAND flash. Elsewhere on the board is a Phison PS5012-E12 controller, a DRAM cache and a small SLC partition. Corsair says that it has put in place "effective thermal management that channels heat away from the PCB, ensuring the ideal mix of performance, reliability and endurance to keep the drive operating optimally for years". However I've had a look through a review of the MP510, published by Guru3D a few hours ago, and it said that the controller can get rather hot under load resulting in throttling, so "a proper M2 heatsink," is recommended. In its email to HEXUS, Corsair said that the Force Series MP510 M.2 PCIe NMVe SSD will be available immediately via its own web store as well as from a variety of retailers and distributors. However, I had a quick check and could only find the 240GB in stock right now (£69.99). At the other end of the pricing scale the 1920GB model costs £439.99 (but is out of stock). Buyers get a five year warranty. Intel Optane DC persistent memory starts at $6.57 per GB Gigabyte Aorus RGB AIC NVMe SSDs listed QOTW: What wattage is your power supply? Elgato Thunderbolt 3 Pro Dock QOTW: How fast is the storage in your PC? I'm interested to see how the performance goes up due to parallelism but then dips at the highest capacity. I wonder if it is reaching the limits of the controller at nearly 2TB? Either way, it's seeming like the best buy for performance is the 960GB. The prices are superb for the performance and endurance. Makes me suspicious. How am I supposed to read game tips on loading screens now! The prices actually seem pretty good for these. I bought the 2TB Intel NVMe drive. It was $330 on newegg. It was worth every penny with the performance i am getting plus the storage space.